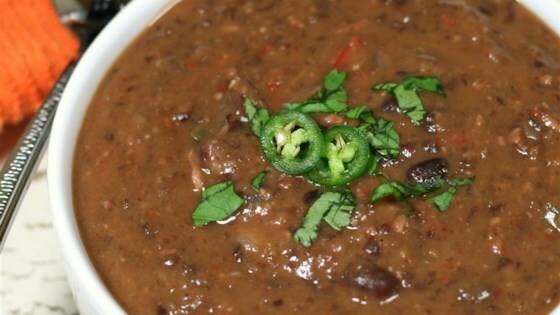 "This black bean soup is given a hint of smokiness through the addition of turkey bacon and chipotle pepper in adobo sauce." Heat olive oil in a large pot over medium heat. Cook and stir bacon, onion, green bell pepper, and red bell pepper in hot oil until the onion is caramelized, about 20 minutes. Stir garlic, chipotle pepper, and cumin into the bacon mixture; cook until the garlic is fragrant, 1 to 2 minutes. Pour black beans and chicken broth into the pot; bring to a boil, reduce heat to medium-low, and simmer until the beans are tender, about 30 minutes. Mash some of the beans with a potato masher until the soup reaches your desired consistency. Made as called for. It was just ok to me. Not bad, but nothing special. Probably won't make again. I used less chicken broth and added plain yogurt after cooking. Great recipe!! Awesome! I will definitely make again! Awesome recipe! We used leftover country ham in place of turkey bacon. Also did not mash any beans. Add a dollop of sour cream and jalapeño cornbread—yummy!